**Disclosure: Thank you to Visit Beloit for hosting my family's visit to Beloit. Starting off the day at Bagels & More in Beloit. We started off one morning fueling up with some comfort breakfast food at Bagels & More before wandering a bit downtown and enjoying the Beloit Farmers' Market. At this point, I had not enjoyed a bagel in awhile. So, that is what I was after. However, Bagels & More has so many more breakfast and lunch offerings. Breakfasts feature quiche, skillets, omelets, pastries and more. Lunch features a large selection of sandwiches, soups and quiche. When you walk in to make your order, you will notice not only a sizable variety of bagels but freshly baked breads as well in addition to a case of sweet pastries. After checking out the selection of bagels, I went with a multigrain bagel and my husband chose a tomato bagel. 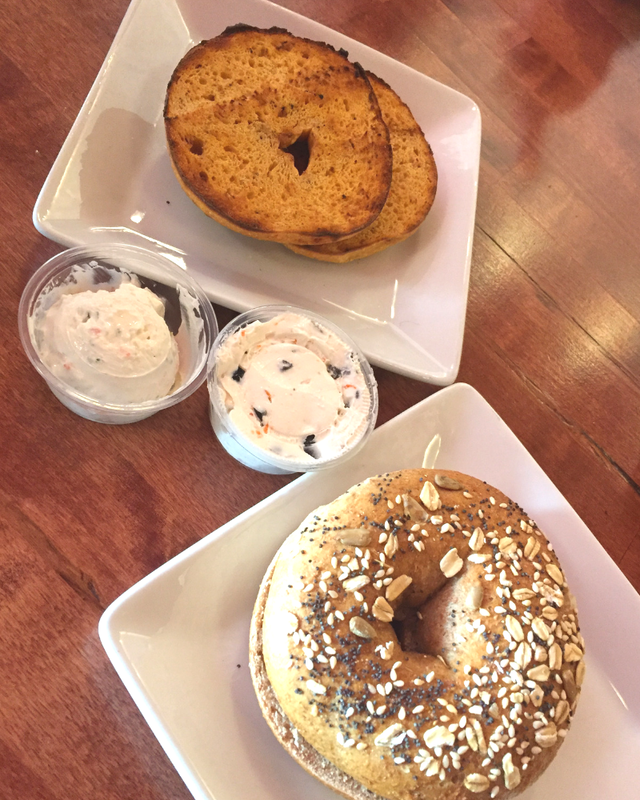 Bagels & More's variety of cream cheeses with mixin's is a sight to behold. There were so many choices! My husband choose an olive cream cheese and I chose a vegetable! Yum! Fresh bagels with intriguing cream cheeses. My daughter went with an omelet with bacon. As you can see, the omelet was quite filling and perfect for starting a day of wandering. The omelet was accompanied with a fruit cup and toast. Delicious! Time for coffee at Blue Collar Coffee Co.
Blue Collar Coffee Co. is a wonderful new addition. Blue Collar Coffee Co. hearkens back to the blue collar history of Beloit. Blue Collar's coffee comes from Ruby Coffee Roasters which is roasted in Nelsonville, Wisconsin. So, a cup of Blue Collar coffee truly is a taste of Wisconsin! I, of course, ordered my favorite mocha latte. My mocha latte was perfect -- nice, robust espresso flavor and not too sweet. Yay! Plus, Blue Collar Coffee Co. puts fun and uplifting sayings on their cups. Nice! Nice warm up with a mocha latte from Blue Collar Coffee. Bushel and Peck's is a heavenly farm-to-table experience! The market and cafe fusion allows visitors to enjoy local farm fresh on the spot in the cafe and take home a variety of items including soups and preserves. I will discuss more about the market in another post. Here I would like to discuss the delicious and farm fresh options at the cafe. We found the menu with a decent number of choices with some rotating items. So, it took us a little bit to choose our meals. My husband settled on the Black Angus Chili. The Black Angus Chili was hearty and full of vegetables -- just what my husband needed on a day of exploring. Plus, it was accompanied with yummy blue tortilla chips made in Janesville. Yum! I went with the potato leek soup with a side salad. The soup was absolutely incredible. The side salad was vibrant with fresh veggies -- just the way I like it! I had a balsamic dressing. Delicious and healthy! Perfect pair -- potato leek soup and veggie side salad! Can't go wrong with a burger and fries! We headed over to South Beloit to briefly check out DC Estate Winery. First of all, I can tell that the grounds are pretty magnificent and would make for a nice site for an event. The day was a bit chilly but there were still quite a few people walking about the grounds. 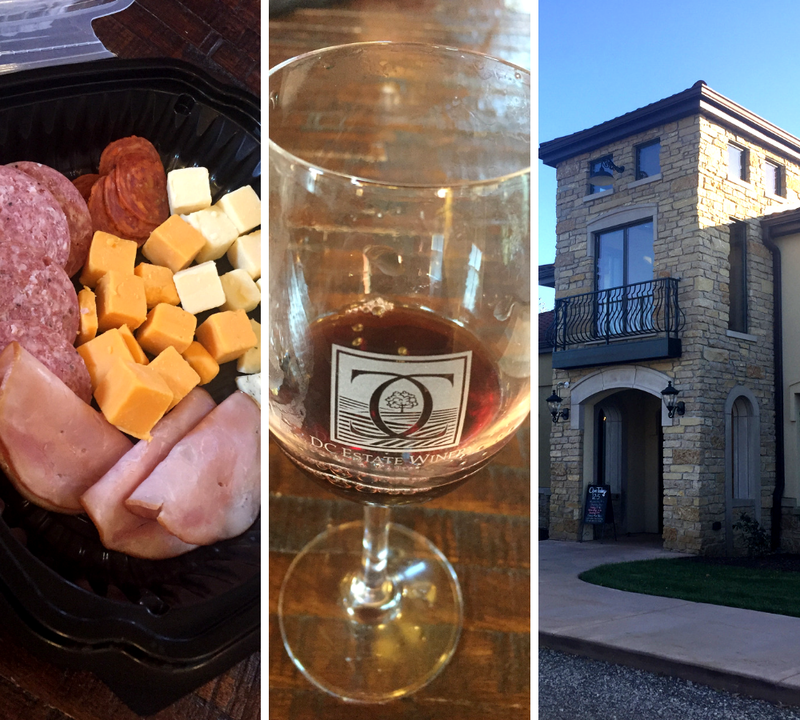 We went inside to enjoy a wine tasting and a meat and cheese tray. You can also enjoy full glasses of wine and other light bites at DC Estate Winery. I also recommend perusing the gift shop for other locally made items. Truly a nice spot to visit! A wine tasting, a little noshing and a lovely venue at DC Estate Winery. Sun setting over a vineyard at DC Estate Winery. Fresh chips and salsa are comfort food! My husband decided a culinary splurge was necessary, so he ordered the Queso Fundido for a side. The Queso Fundido is a blend of manchego and chihuahua cheese with poblano peppers. The appetizer is very delicious and a bit decadent. The cheese made for a great combo -- so if you are going to indulge, this is a dish to do it with! Spoiling ourselves with Queso Fundido! We all settled on different tacos to try. I tried the Shrimp Curry and the Chicken Tinga. The Chicken Tinga is composed of roasted chicken, lime sour cream, fresco cheese and slice radish. I really enjoyed the Chicken Tinga and found the chicken to be tender with a nice saltiness from the fresco cheese. The Shrimp Curry Taco features grilled shrimp in a green curry sauce with Asian slaw and cilantro. Both tacos were delicious but I have to give the edge to the Chicken Tinga. Plus, the corn tortillas are housemade. Tasty and fresh flavors! My husband enjoyed the Brussels Sprouts Taco and the Peking Duck Taco. Both tacos are pretty inventive. The Brussels Sprouts Taco is an excellent veggie option featuring charred brussels sprouts, potato, muenster cheese and morita salsa. Great way to get your veggies! The Peking Duck Taco is another fresh flavor option featuring roasted duck, hoisin sauce, cucumber, scallions and cilantro. You can really have some fun at Truk't! 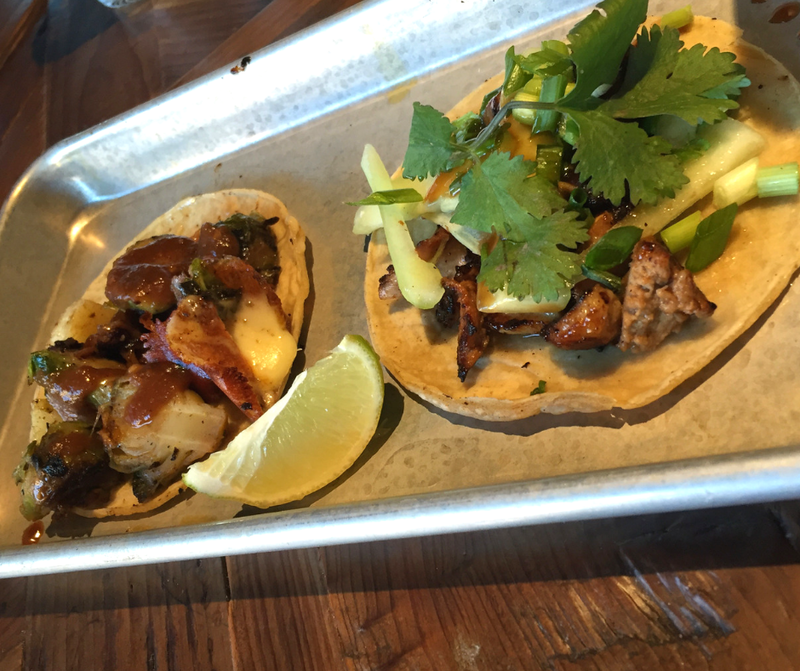 Inventive Brussels Sprout Taco and Peking Duck Taco at Truk't! For the past couple of years, my daughter has favored a good Pork Al Pastor Taco. When she saw one on the menu, she HAD to order two. Pork Al Pastor Tacos are her absolute favorite and look at these with wonderful pineapple, Spanish onion and cilantro on top! The Pork Al Pastor Tacos at Truk't are so vibrant with pineapple on top! We loved our food explorations in Beloit. 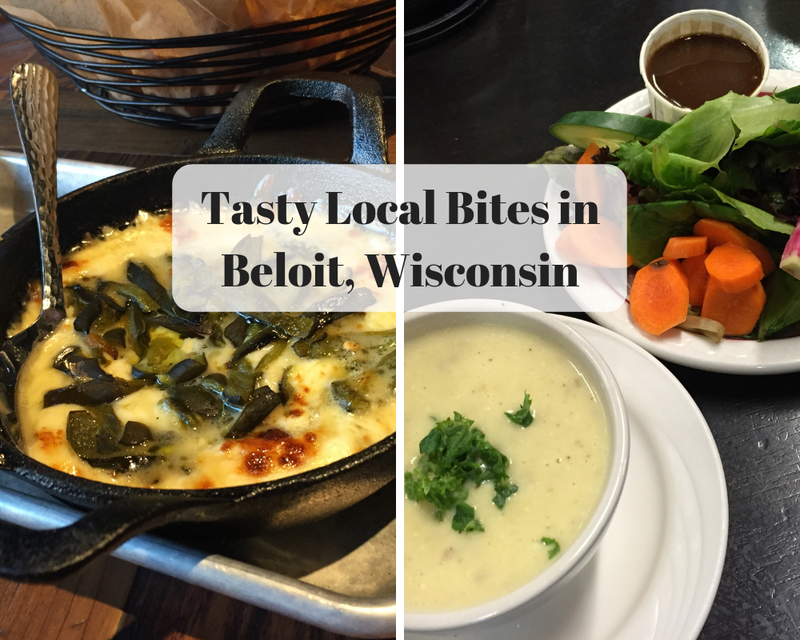 Before our visit, I had no idea that Beloit featured such a range of local culinary experiences. We found our foodie adventure exciting and flavorful. We will definitely be back! 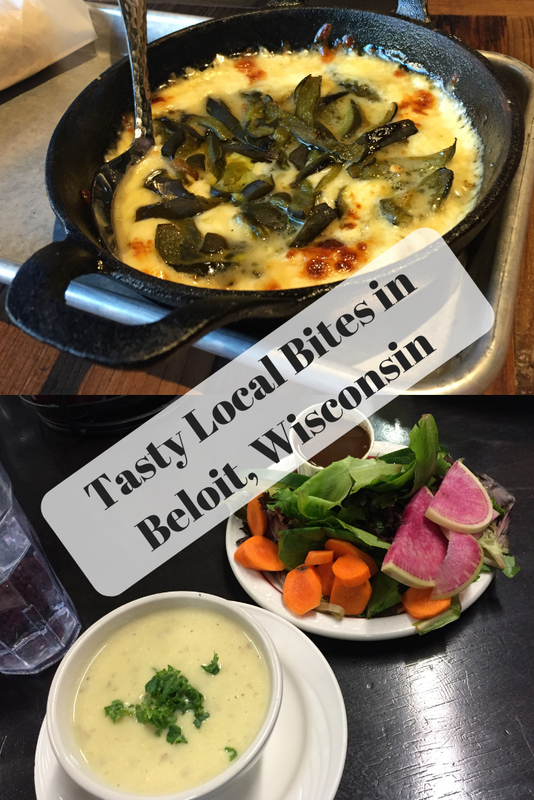 For more on our trip to Beloit and Janesville, Wisconsin see: Discovering Beloit and Janesville, Wisconsin: Fabulous Fall Family Weekend. We love Bushel and Pecks! I can't wait to go back up to Wisconsin so I can make this a must stop destination, purely for the food!